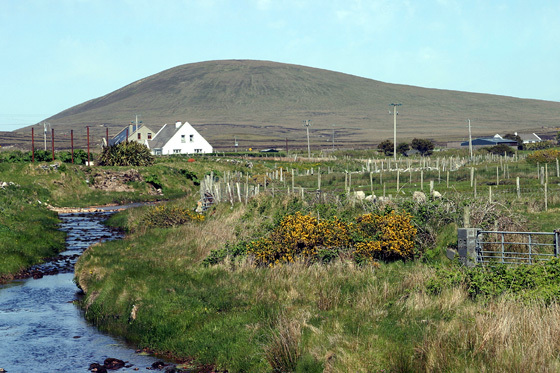 This hill is unnamed on OS maps but is mentioned in the Co. Mayo Development Plan as Doogort Hill. However, a local bi-lingual walking guide names as Cruinneoc (which has here been standardised to Cruinneog), a wonderfully descriptive name for this little round hill. The round shape is very evident from the pattern of concentric oval-shaped contours on the map. The anglicised form Krinnuck is found on William Bald's map of Mayo (1830). This is a good example of how easily local names can be lost and are sometimes unknown even to local authorities in whose area they are located. For a walk around the base of Krinnuck, see Siúlóidí Acla, walk F. Krinnuck is the 1368th highest place in Ireland. Krinnuck is the second most northerly summit in the Achill/Corraun area.